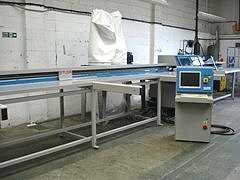 Stuga Autocut automatic saw centre, refurbished including repainting where required. These machines are complete with label printer, offcut conveyor and dust extractor, and can cut up to 700 windows per week automatically, with little skill. These saws are updated to Microsoft Windows (currently Windows 7) operating system with new computer and control systems. 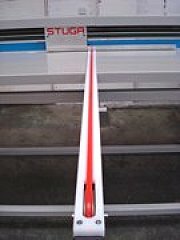 It should be noted that many older Stuga saws are likely to need this as the old DOS system is totally obsolete and not supported. Why waste money on a double mitre saw? Price includes delivery, installation and training, plus twelve month's warranty. We buy and sell these regularly and refurbish to order. Most are feeding from left to right. Deliveries can be extended due to workload but this model is worth waiting for. Visitors to the Stuga factory are always welcome. Please contact us for a precise quotation based on your exact requirements. This machine new is £70,000 and can be built in either hand. We seem to have these items quite often, but not always, so please check stock situation when enquiring. The guide price is a general guide, and the actual price will depend on how much the donor machine costs Stuga and how much work is needed to bring it to an 'as-new' standard.